There have been no female recipients of the award since 2000, when Aung San Suu Kyi was honoured. 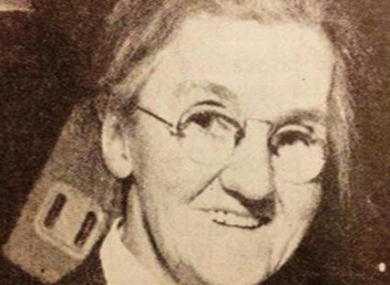 Trade Unionist Rosie Hackett, whose name was given to Dublin's newest Bridge after a Labour Youth campaign. LABOUR COUNCILLORS WEREN’T too happy when the list of names to receive the Freedom of Dublin was made public yesterday. To be clear — they didn’t have any problem with either soccer legend John Giles or Brother Kevin Crowley, of the Capuchin Day Centre, being put forward by Lord Mayor Christy Burke. Rather, the lack of women was an issue. “I was very disappointed last year when no women were considered and I raised the issue privately,” Councillor Rebecca Moynihan told this website yesterday. This year when I heard that there were no women nominated again, I contacted the Lord Mayor, Christy Burke, to discuss this and suggest women’s names. Aung San Suu Kyi (who was under house arrest at the time) was the last person to be honoured with the freedom of the city, in 2000 — sharing the award with the four members of U2 and Paul McGuinness. What woman would you nominate for the honour? Remember, the recipient doesn’t necessarily have to be from the city — Brother Crowley is from Cork, for instance (for that matter, obviously Aung San Suu Kyi is from Burma). Email “Open Thread: Nominations for a WOMAN to receive the Freedom of Dublin, please!”. Feedback on “Open Thread: Nominations for a WOMAN to receive the Freedom of Dublin, please!”.